A purpose of the BH6520B control embedded module is to control linear and switched power supplies and generators. The modules has two independent and hardware decoded 24 ppr rotary encoders, one for voltage setting, the second for current setting. For controlling the power unit, the module has two A/D inputs, two D/A outputs and several digital I/O lines. The SPI bus is available on feature connector for possible add-on circuits. The module has two outputs for connecting two independend 4½ digits LED voltmeters. 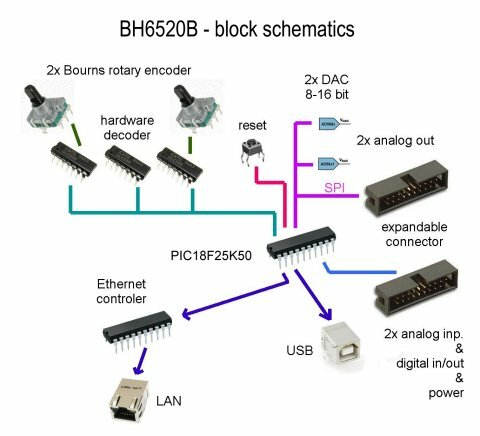 Optionally, the BH6520B can be populated with two interfaces, USB and Ethernet, for a remote control. The BH6520B module size is 190 mm x 40 mm.